All that cream and milk didn’t make Garry’s tummy happy, so I decided to try a different chowder. I didn’t have more clams, but I had frozen shrimp. You can make this same chowder using any seafood from shrimp to haddock. I think shellfish is easier and less likely to fall apart, but it’s entirely a matter of your taste — and what you can find in the freezer section of your grocery. Unless you know a fisherman. I have almost as many problems with tomatoes as Garry has with lactose. I can sometimes get away with eating it once in a while … so I figured I’d give it a try. Aren’t allergies and sensitivities fun? Sometimes cooking for a family gets to be like tiptoeing through a minefield. He’s allergic to carrots. The other one is lactose-intolerant. I can’t eat anything acidic. That one over there has diverticulitis and his wife recently had a gastric bypass, so she probably won’t eat anything. I want to serve it all with a good crusty bread, except someone is bound to be on an anti-gluten diet. Of course, shellfish allergies are common, so before you serve it, check and make sure you aren’t going to make someone horribly ill. One horribly ill guest can totally ruin an otherwise good dinner. It’s one of the things I do NOT miss about a larger family. Garry and I have enough eating issues. Add a few more people and I’d give up cooking. I ultimately created the simplest recipe I could. It is hellishly hot here. My kitchen is the warmest room in the house. After I start boiling stuff, it becomes a steam room, so simpler is better. The shrimp is pre-cooked. The hardest part of this recipe is chopping up the vegetables. 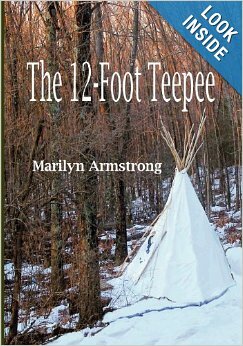 The chopper I bought based on Judy Brown-Dykstra’s recommendation is turning out to be one of those “how did I live without it” goodies. All my diced vegetables are perfect, exactly the right size, including the potatoes. It’s a miracle! My entire life of cooking I have suffered from unfortunately chopped vegetables. Whatever I chop first is fine, but for each subsequent veggie, my chopping becomes more erratic. With this lovely little chopper, it’s so tidy and organized. The only thing it won’t chop is celery. It refuses. Note: Vegetable amounts are all “more or less.” You can use more onion, less pepper, more pepper, carrots, corn. It’s entirely up to you and will not change the way it tastes very much. Because I was using cooked shrimp, all I had to do was defrost it and remove the tails, then put it back into the fridge. I scrubbed two Idaho potatoes, sliced and diced them and put them in a pot to boil. While they were cooking, I diced up the onion, pepper, and chopped the celery. I put it all in a bowl. I measured out the Clamato juice, the steak sauce, pulled 4 pieces of bacon from the fridge, chopped it up and put it in a pot to fry. When it was mostly done, I threw in all the chopped vegetables and cooked them in the bacon fat for about 10 minutes. Then, I added the garlic. In between each addition, I washed whatever was dirty because I really hate a messy kitchen. Even if I’m not doing the cleaning, I still hate the mess. I’ve cleaned a lot of horrible kitchens and I may not be the best cook in the world, but I am absolutely the neatest, cleanest anywhere. A couple of minutes later, I added the Clamato juice, tomatoes, and steak sauce and brought it all to a boil. 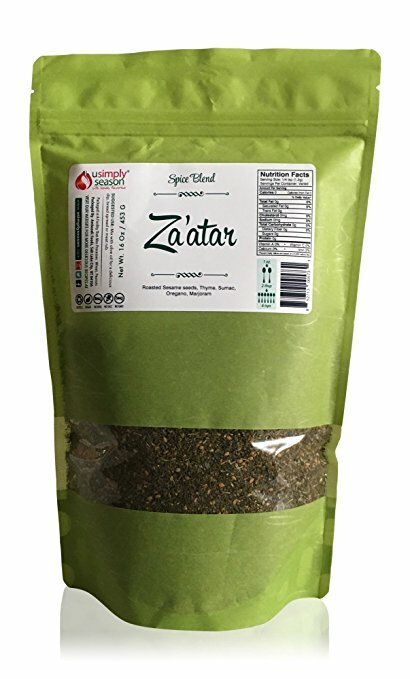 I added the thyme and just for kicks, threw in some Za’atar because it has become my “I can’t cook anything without it” spice mix. I added a bit of salt, a splash of white pepper and stirred. Tasted it. 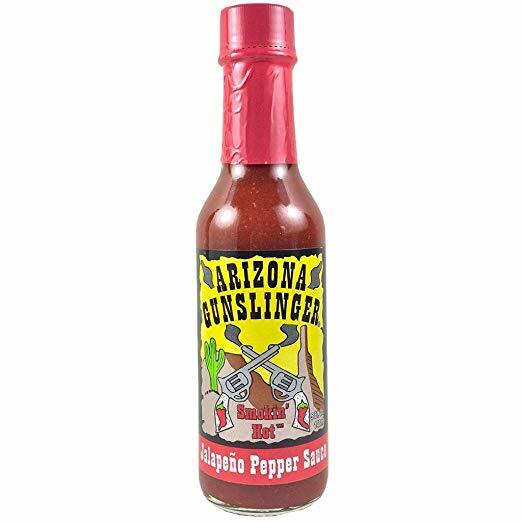 I grabbed my favorite Arizona Gunslinger Smokin Jalapeno Red hot sauce. Tasted. Added a half a dozen drops more. Brought it back to a boil. Garry had brought home some focaccia bread and I turned on the toaster oven. It was just waiting for my “go” signal. I added the shrimp. With one minute remaining on the toasting bread, I yelled “DINNER!” and all the dogs came running. I always wonder about that. Do they believe I’m doing all this cooking for them? Or is it some inherent DNA-based optimism given to all dogs? I yelled louder and Garry stopped watching baseball and came to the kitchen to claim his dinner. Dinner was a success, or as we put it around here: “So far, so good.” No one’s stomach has erupted. Yet. The dogs are still waiting for their servings and lucky dogs, there is enough left so they can have at least some of the soup with their kibble tomorrow. Maybe I’ll let each one have a shrimp, too. The original recipe calls for an additional 1/2 pound of miscellaneous seafood such as mussels, clams, scallops, squid, or even haddock. I didn’t want to make that much food. When you add the extra 1/2 pound of seafood, you also need an extra cup of Clamato juice. The full recipe should feed six, with second helpings. The way I made it, it will feed four. As an appetizer, six or eight probably. 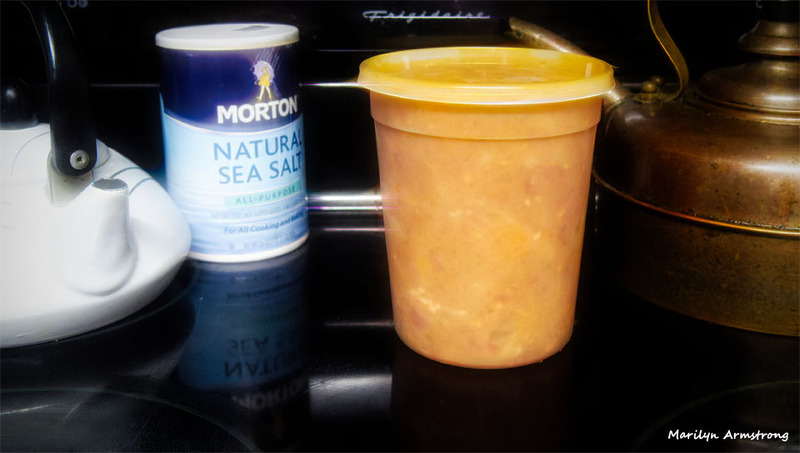 I have a very full quart of leftovers for tomorrow. I used fresh diced tomatoes rather than stewed because I prefer them. I left out the carrots because I was tired of chopping and my wrists were beginning to hurt. I didn’t use red pepper flakes because I like my own hot sauce. I think you could probably use fish broth rather than Clamato juice, but then you’d need maybe half a cup of tomato paste. 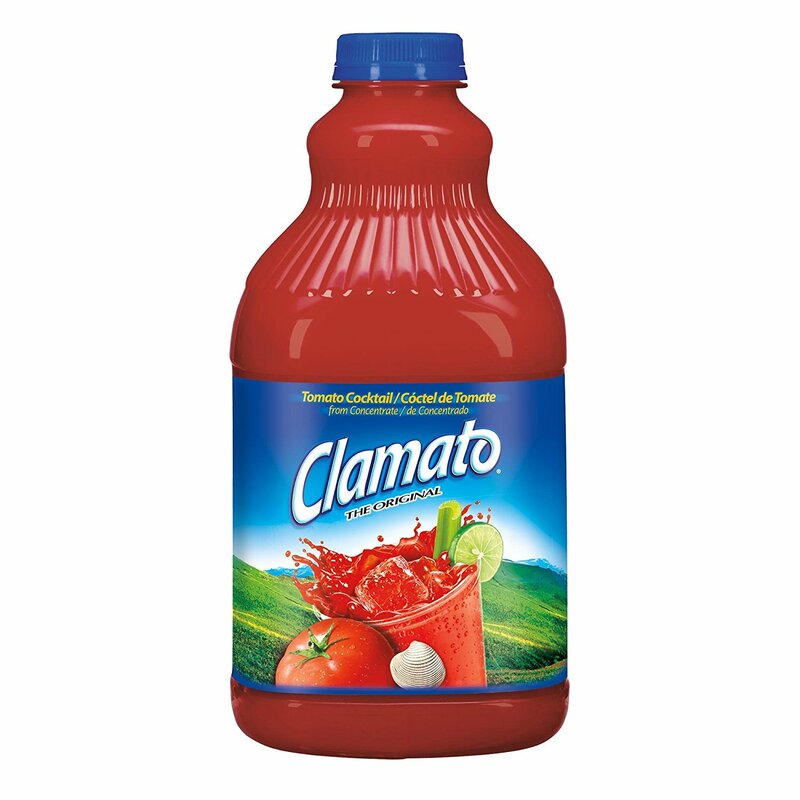 Clamato juice seemed easier and it comes in a bottle with a screw-on lid. Also, you can buy it in a spicy version. NOTE: Many people like Clamato juice mixed with iced vodka, so your alcoholic preferences could affect your choice of Clamato juice. Good crusty bread is the winning complement to the chowder. You can change the recipe to suit allergies, personal taste — and what you happen to have on hand. Aside from the chopping, it’s easy. Get the little chopper and it’s about 50% easier. If you want this to be a bisque, run it through a food processor. Voila, bisque! It’s very easy to use, too and easy to clean. I wondered if I’d really use it, but I find I use it all the time. It’s so much better than any of the other chopping machines I’ve had. It doesn’t turn the veggies into pulp. They are still real vegetables. 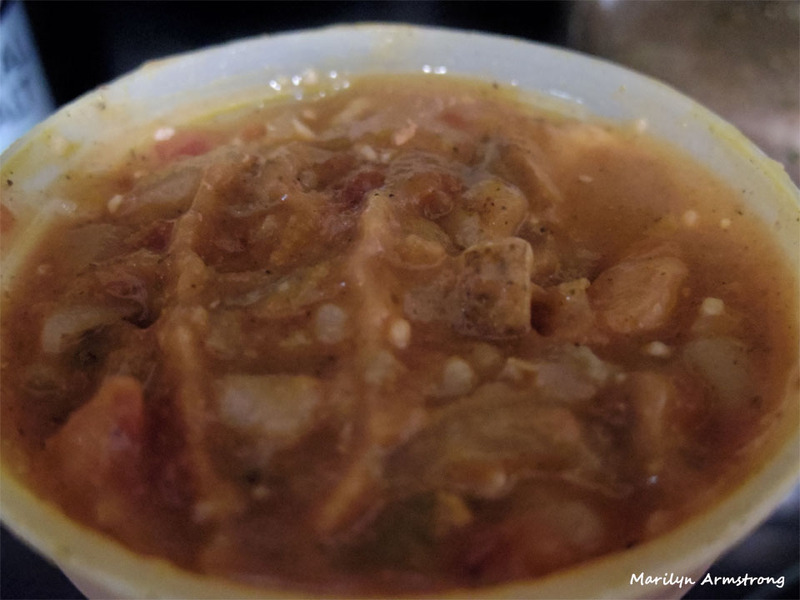 MARILYN, Your Manhattan Clam Chow-der is absolutely DEE-lish! It’s a keeper. Thank you! I’m with Garry about the milk and dairy. Weird for a girl from Normandy, France. I love cheese and I’m fine with them. But too much milk and cream are not for me either. So this is great to have your ‘clam clowder with a twist’ recipe. I also noted the name of yoru cutting thingy since it looks great. 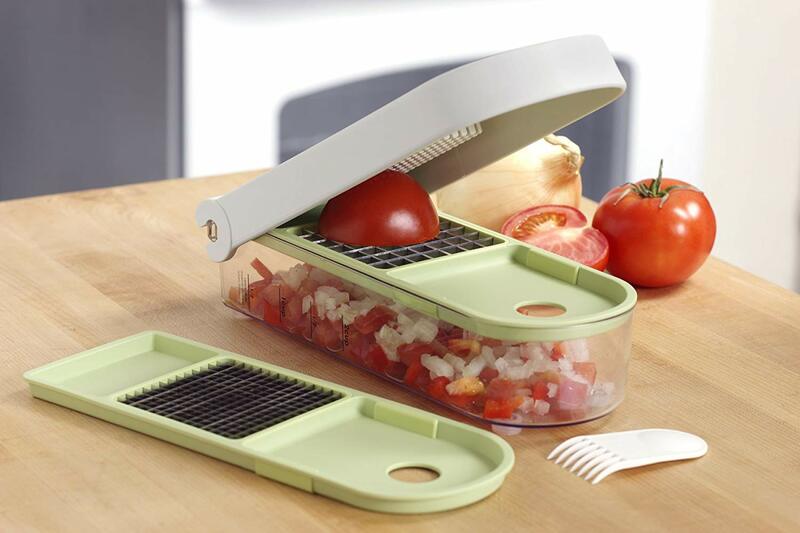 We used to have a mandoline but my husband cut himself very badly with it once, so we aren’t using it anymore. Yours seems much safer! Garry was able to eat this, no problem. And shrimp are easier to find frozen than clams, though I think you could make this with any seafood. That little chopping tool lets you keep your finger away from the blades. But they ARE very sharp and if you touch them while cleaning, you can nick yourself too. I suppose if they weren’t sharp, it wouldn’t work. It’s not expensive, either. I got it from Amazon, but I think it’s available in a lot of places. 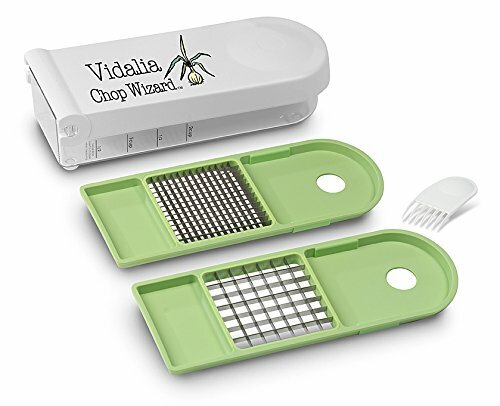 It’s the first cutter I’ve found that hasn’t removed the tips of my fingers and leaves the vegetable in pieces, not just crushed. 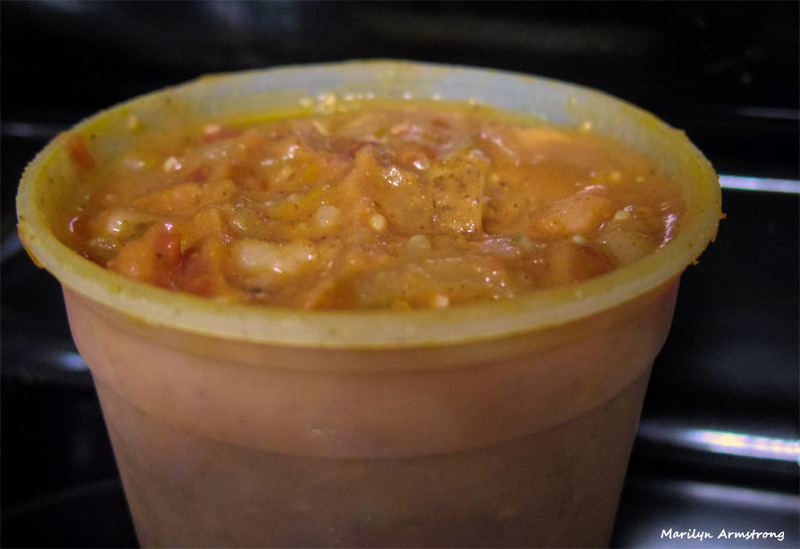 Food processors just make everything a big gloppy mess. I was told that most hard cheese has very little lactose and yogurt should be okay too, but milk, cream — especially ice cream — are definitely not for the lactose intolerant. You have no idea how glad I am for frozen yogurt! Looks yummy. I’ll be right over. You don’t mind if I pick out any tomato chunks, though, do you? Can’t handle tomato pieces, although the juice is ok. Oh, and the bread doesn’t have seeds, right? I’d have to pick those off, too. And I prefer unsalted butter to spread on the bread, if you don’t mind. But other than that I think I’d made a great dinner companion. I have the same tomato issue. The juice — as long as it is cooked — I seem to do better with. Maybe next time I’ll make it without the tomato pieces. It was a first, so I was sort of following a recipe. Sort of. Yeah, I’m fine with tomato sauce, too, so long as it’s not chunky. Go figure. Sounds so delicious! I wish! Too many allergies …maybe one day! Allergies really make eating normally a pain! I only have ONE allergy (duck of all things), but I have a lot of sensitivities. I’m always trying to find a way around them. Sometimes I can eat a little bit of something, but I have to be careful not to push that envelope. Yeah, I know the allergy thing well, as in deadly allergies. My daughter is deadly allergic to fish and shellfish and has a multitude of minor allergies and sensitivities – cucumber of all things! We are all deadly allergic to penicilan (sp) and my son is deadly allergic to all meds that they use to replace it. Literally 5 families that will kill him, so it’s always been a concern when he got sick. He had to fight it with his immune system alone and whatever natural vit. etc I could use. It was rough. it came out pretty well. I was surprised, probably because I’ve always preferred the New England version. But this was definitely less lethal and very much less caloric. You could eat it and not feel the fat running through your veins. That’s one reason why I tend to use buttermilk instead of cream. It has 1% butter fat and still tastes pretty good. It’s delicious and just as good the second day as the first.